The FIRST cross-company collaboration that brought together products and solutions for the real estate vertical took place in the form of Developers’ Forum in Kuala Lumpur, Malaysia, from 28-30 September, 2015. Led by Panasonic System Solutions Asia Pacific (PSSAP), the inaugural event was attended by 83 guests from 9 countries in Asia. 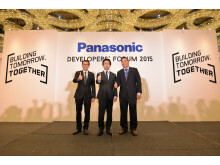 The event served as a platform for industry knowledge sharing and networking, but more importantly aimed to enhance partnerships between Panasonic and regional real estate developers. Panasonic’s core competence has always been the reliable company offering a wide range of electronics products. Integrating products into complete solutions for customers is the next part of the evolution, and the strategic intent of PSSAP is to provide localized consultation and systems integration for the Asia Pacific region. Mr. Tai offered unique perspectives to the audience to break out of the traditional archaic model of buying land, building, developing and selling. The value chain can be damaging and restricting for both developers and buyers. He suggested drawing key principals of specialisation from car manufacturing and deploying digital technologies or information and communication technologies (ICT) to enhance quality and performance of urban services, to reduce costs and resource consumption, and to engage more effectively and actively with its citizens. Mr. Tai concluded that social engineering is lacking in current city developments and calls on key industry players to change mindset, tap into simple technology solutions that are affordable and also sustainable, to play their part in making our planet a more interactive space for its residents. Mr. Wakabayashi Kohjiroh, Managing Director, PanaHome Asia Pacific, addressed the delegates with an introduction of PanaHome, followed by Ms. Keiko Miyazaki, General Manager,Strategy and Global Marketing, delivering an overview of the Fujisawa Sustainable Smart Town (SST). 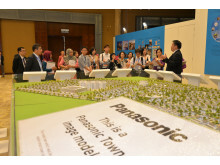 The smart town project, spearheaded by Panasonic, epitomizes the future of urban living. Cities of today need to be both smart and sustainable, one of which is through the utilization of innovative technologies. The town’s vision of “bringing energy to life” is highlighted in its five essential services – energy, security, mobility, healthcare and community. Based on the Fujisawa SST case study, delegates get to learn how developments can minimize the consumption of energy. It was more than encouraging getting feedback from delegates that they found the conference programs to be relevant and useful for their business. “We want to see more presentations on actual projects/case studies using Panasonic products,” Mr. Steven Su, General Manager of EcoWorld commented. At the Developers’ Forum exhibition section, a holistic suite of products and solutions was showcased in three different zones, namely Living, Retail and Infrastructure. The Living Zone covers our core business of Panasonic home appliances delivering the modern comforts of homes as well as our personal and beauty range of products. 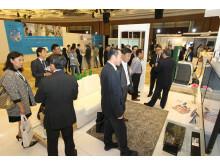 The value of Panasonic solutions such as the Home Network System, Home Energy Management System and the Green Room System demonstrated how Panasonic can help improve security and energy consumption of residential or hospitality segments. In the Retail Zone, our visual display products take centre stage in the mall area as tools to capture shoppers’ attention and generate desire to purchase. Whereas in the control room, security solutions were the main features that demonstrated how we can deliver beyond just basic surveillance functions to include shopper analytics. VRF Smart Cloud solution presents an efficient way to address the growing cost of energy and manpower to operate large malls while maintaining a comfortable environment for tenants and shoppers. Infrastructure Zone completes the full circle in asset management for developers with our solar panels, storage battery and license plate recognition car park solution. 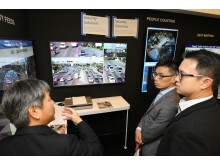 Between 2nd and 5th June, Panasonic System Solution Asia Pacific (PSSAP) unveiled its latest business solutions at CommunicAsia and BroadcastAsia 2015. It brought to life how businesses can stay connected and mobile in today’s dynamic environment.